iTier Solutions Gives an opportunity to its client to take the full advantage of specialized software product development techniques. 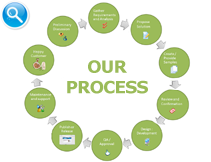 Data Processing Services: Entry formatting, conversion extraction, transformation management. iTier Solutions has introduced online facility for any company to manage their employee systems through their company website effectively.